Replacements for decayed or lost teeth have been produced for a few thousand years. The Etruscans (people from the ancient country of Etruria in western Italy) made skillfully designed false teeth out of ivory and bone. These false teeth were secured in the mouth by gold bridgework as early as 700 B.C. Unfortunately, the skills and artistry that went into these efforts were lost until the 1800s. During medieval times, the practice of dentistry was largely confined to tooth extraction. Replacement and repair were seldom considered. Gaps between teeth were expected, even among the rich and powerful. Queen Elizabeth I of England (1533-1603) filled the holes in her mouth with cloth to improve her appearance in public. When hand-carved false teeth were installed, they were tied in place with silk threads. If not enough natural teeth remained to tie the dentures to, anchoring false ones was difficult. People who wore full sets of dentures had to remove them when they wanted to eat. Upper and lower plates fit poorly and were held together with steel springs. Because the sets were not anchored, they could spring suddenly out of the wearer's mouth. 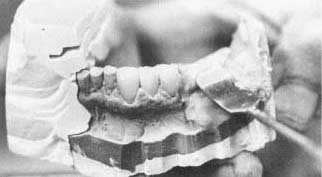 Even George Washington (1732-1799) suffered terribly from tooth loss and ill-fitting dentures. The major obstacles to progress were finding suitable materials for false teeth, making accurate measurements of a patient's mouth, and getting the teeth to stay in place. These problems began to be solved during the 1700s. In 1774 the French pharmacist Duchateau enlisted the help of the prominent dentist Dubois de Chemant to design hard-baked, rot-proof porcelain (a hard, white ceramic) dentures. De Chemant patented his improved version of these "Mineral Paste Teeth" in 1789 and took them with him when he emigrated to England shortly afterward. The single porcelain tooth held in place by an imbedded platinum pin was invented in 1808 by the Italian dentist Giuseppangelo Fonzi. Inspired by his dis-like of handling dead people's teeth, Claudius Ash of London, England, invented an improved porcelain tooth around 1837. Porcelain teeth came to the United States in 1817 via the French dentist A. A. Planteau. The famous American artist Charles Peale (1741-1847) began baking mineral teeth in Philadelphia, Pennsylvania, in 1822. Commercial manufacture of porcelain teeth in the United States was begun, also in Philadelphia, around 1825 by Samuel Stockton. In 1844 Stockton's nephew founded the S. S. White Company, which greatly improved the design of artificial teeth and marketed them on a large scale. Porcelain is no longer used because better materials have been developed. Today, dentures are made from either plastic or ceramic. These materials can be tinted to match existing teeth and look more like real teeth than ever before. Dentures are prepared in a mold. Today, dentures are made from either plastic or ceramic. In 1756 Philip Pfaff (1715-1767) of Germany introduced plaster of paris impressions of patients' teeth. This made it possible to produce dentures that perfectly fit. The real breakthrough in dentures came with the American inventor Charles Goodyear's (1800- 1860) discovery of vulcanized rubber in 1839. This cheap, easy-to-work material could be molded to fit the mouth and made a good base to hold false teeth. Well-mounted, properly sized dentures could now be made inexpensively. The timing was ideal. Horace Wells (1815-1848) had just introduced painless tooth extraction using nitrous oxide. The number of people having teeth removed skyrocketed. This created a great demand for good, affordable dentures, which Goodyear's invention made possible. The problem I have about my new dentures is that it really hurts just sliding them in. I mean really hurts like scraping them against bone spurs covered by a thin layer of skin. After each fitting I seem to taste blood as if the skin had been scrapped. I have had my dentures both upper and lower for 50 years. I keep them in my mouth 24-7 so I don't loose them. they are porcelian and have served me well. I now am getting new ones. But can't decide between the porcelian and the Phonares ( a new material). Is it possible that dentures could "melt" under the effct of saliva? I feel like mine are producing sort of bad taste in my mouth, on my tongue, and that does not happen when I am not having them. I've had my teeth since I was 23,(am now 72. In the very beginning I was told to leave then in my mouth 24/7. Since then I was advised by my dentist (not the original. " To remove them and let the mouth tissues breath., which I have followed. I visit the dentist regulary ( every 6 mo) and he checks my mouth for mouth cancer, which scares the hell out of me (my dentist does not charge to check me out). As a newbie denture (non)-wearer, the plastic teeth don't mesh properly, the hard plastic "gums" cuts into my gums, the uppers fit fairly well with suction only (though the slick hard palate keeps my tongue busy and I produce copious saliva), but the lowers are an alien invading my mouth, and soon become a confusing mixup with any attempt at chewing solid food! As an accomplished mold and model maker, I am SERIOUSLY considering crafting my own dentures. I believe can do a better job for a LOT less than the jerk that slapped denture adhesive into healing socket wounds! Ever had dental adhesive halfway down your throat, and it refused to let go and just swallow already? Trying to get that gak out of the hard palate hollow took nearly a half roll of toilette paper! I am considering using silicone rubber (pink of course) as the gum and "soft liner" analog, surrounding resin matrix arches, holding ceramic teeth. Silicone rubber is a superior material, quite hardy chemically and thermally (I've used it to cast molten lead), biologically rather neutral, and wrap around overhangs and undercuts quite reliably. The question is, silicone rubber will not wet, is hydro-phobic, and is "non-lubricitus". I am worried about "dry gums" and possible complications of using such a material for long term oral placements. Does anyone have any research data on the use of silicone rubber in the mouth for extended periods of time? I wear false teeth. I really like them. I need more.